Internet search engine giant Google is out to take steps towards reducing the company's environmental impact, an initiative that resulted in EI Solutions installing the world's largest corporate solar project-more than 9,000 solar PV panels covering seven acres-at the Google campus in California. 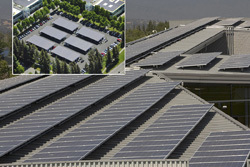 If you were to Google "world's largest corporate solar project," you'd likely find yourself right back at Google, where more than 9,000 solar photovoltaic panels covering seven acres have been installed on the company's corporate campus, in Mountain View, California. The project will generate 1.6 megawatts-the equivalent of powering about 1,000 average California homes. This wasn't one of those projects that started small and grew out of control. Google set out to do something extraordinary-something that was good for customers, employees and the planet. Their goal was to take a step toward reducing their environmental impact, and at the same time deliver positive results for their bottom line. With the help of EI Solutions (EIS) they found an environmental and economic answer they were looking for. "I think, as with a lot of companies, they were very focused on making sure they didn't do something that someone might call window dressing," says Andrew Beebe, president of EIS. "They wanted to do something meaningful, something that was big, had an impact and that made sense." The enormous project started with a phone call, and the two companies began educating each other. EIS learned what Google was trying to accomplish from a corporate perspective, and Google learned what was possible in the world of solar. Once Google made the decision to go solar, EIS spent months learning everything possible about Google's corporate campus. "When looking at a large-scale commercial solar project, there are a lot of things you need to ask," explains Beebe. "Do you own the building? Do you lease it? How long is the lease? Who has what kind of roof rights? What kind of work disruption will there be? There are a lot of issues." But once the months of discussions and research were over, the construction was quick. The design phase took approximately three months and the implementation phase was completed in six. "During those six months, very little time was spent on the roof," says Beebe "We had pretty rigorous requirements from Google about work disruption. We did all of our crane lifts, approximately 200, on the weekends. "And although there was a lot of material going up on the roof, we moved very quickly once it was up there so that there was minimal banging and moving around of things during the week." The project involved some 9,212 208-watt solar modules provided by Sharp Electronics' Solar Energy Solutions Group. The panels covered multiple buildings, so one of the biggest challenges became creating a design that encompassed the different slopes. "It wasn't a cookie cutter job," Beebe says. "We had done many smaller installations that had involved components of the Google project. But it was all brought together at the Google campus. We were wrapping three different mounting systems, four different roof types and two different carports. It required a lot of different solutions," says Beebe. Despite the massive scope of the project, EIS not only finished ahead of schedule, but also on budget. And more importantly, the Google management team was extremely pleased with the results. EI Solutions had done many smaller installations that had involved components of the Google project. But these were all brought together at the Google campus. The project involved wrapping three different mounting systems, four different roof types and two different carports-overall, it required a lot of different solutions. Google, like many other corporations around the country, is baseloading off solar. "This means that they are running everything off of the system," explains Beebe. "The electricity is going directly into their grid. When the sun is shining, they use it to baseload their power and they use less grid power. So they can peak shave and avoid paying peak pricing when electricity is most expensive in the late afternoons." EIS and Google estimate that the solar panels will supply 30 percent of the company's annual electrical needs, which will save the company more than $393,000 per year. In addition, the system should pay for itself in about 7.5 years. Those are huge numbers, but other companies could expect even high percentages. "It all depends on how much roof area (or adjacent land or parking area) is available relative to the load in the building," says Steve Chadima, executive vice-president, external affairs for EIS. "We have had other projects where we were able to offset significantly more. For example, at the Las Gallinas Valley Sanitary District in San Rafael, we were able to use two acres of adjacent land to build a system that offset 60 percent of their energy consumption. "But because of net metering in California, where you are given credit on a dollar basis for excess generation during expensive peak summer afternoons that can be used to offset low-cost evening and winter electricity, we were able to cut their electricity bill by 90 percent. It all depends on the individual situation."
. Minimal shading of the roof or ground area where the solar is to be located.
. Lots of sunshine (although solar can work in every U.S. state).
. The availability of utility or state incentive programs.
. High daytime electricity rates, especially relative to other time periods. 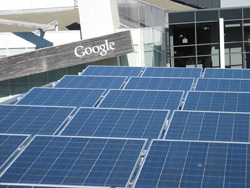 In addition to the financial savings, Google is also enjoying other great solar features. It's 100 percent clean, and completely silent. And the permanent solar panels don't need any maintenance, upgrading or operational support. "We do go out and check on them, and we can wash them off for them, which will enhance the performance. But this kind of technology has been around for decades. It's tried and true, and it works very well," says Beebe. "There are systems out there now that have been running for 30 years and, in fact, are exceeding expectations." The first solar panels were invented by Bell Labs in the 1950s. And over the years they have become more efficient, and as Beebe puts it, "become fairly standard equipment." Google's ambitious project has definitely had a positive impact. It's garnered the company a great deal of media attention for its efforts and Google continues to be seen as a corporate environmental leader. It has also generated more interest in solar projects from other companies. "Wal-Mart's committed to putting solar on many of their stores, and other companies are installing solar as well," says Chadima. "There is clear interest among corporations in finding out how solar can contribute to their efforts to reduce their carbon impact." Of course that's just part of a growing interest in solar. For example, in August 2006, Governor Arnold Schwarzenegger signed into law the Million Solar Roofs bill, creating the statewide goal of building a million solar roofs within ten years. If California meets its goal, the state will have 3,000 MW of clean solar electricity, a nearly 30-fold increase from today's solar power capacity. Rising gas prices have also had a positive impact. "This remains one of the most curious aspects of the solar industry," says Chadima. "Even though there is no connection between the price of gasoline and the price of electricity, rising gas prices pique interest in solar, perhaps only because it increases people's general awareness of energy prices, and solar is one way they can ensure stable future prices for one part of their energy mix." But it's probably the growing concern over climate change that really has people seeking out renewable resources, like solar, as part of a future energy solution. And EIS sees itself, and the solar industry, as a vital component in the overall effort to reduce greenhouse gas emissions. "Every solar installation reduces the need to generate electricity from natural gas or coal, so the connection to climate change is immediate and direct," says Chadima. "As prices of solar decline, and the costs of the environmental impacts of burning fossil fuels to produce electricity are worked into its price, by requiring new technologies such as carbon sequestration, solar will become less expensive than traditional fuels, further accelerating its impact on the environment." But it is leaders like Google that show others that it can be done. They are investing in the belief that part of being a successful corporation is being a responsible corporate citizen. "I think Google chose this project as part of its overall vision-one step toward a larger, more positive impact on the world," says Beebe.